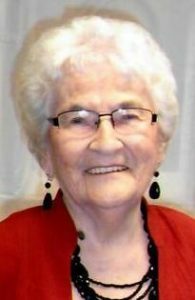 Evelyn K. Baker, age 95, of River Falls passed away on Thursday, April 4, 2019 at the River Falls Area Hospital. She was born March 28, 1924 to William and Kathryn (Haberstich) Ray in Clifton Township. She had five sisters, Pearl Wurst, Irene Maher, Gladys Hinsch, Marian Van Hollan and Lorraine Thompson. Two brothers, Ferris and her twin, Everett. Everett passed away at the age of four from appendicitis. Often the story was told about how small the twins were when they were born (Evelyn weighing 3lb 12 oz and Everett 4lb 13oz) and that their parents put them in dresser drawers to sleep. Evelyn attended a one-room elementary school located on Jerusalem Corner. To attend high school, she moved to River Falls to live with aunt Mary Ray and worked after school at the Candy Kitchen. She met her future husband, Stuart Baker, at the dance hall on Main Street in River Falls. She moved to Red Wing and worked at Nybo’s Café. In 1999, Evelyn and Stuart moved from the farm into River Falls. Evelyn is survived by her children, Beverly (Galen) Sneesby, Bill (Judy) Baker, Dennis (Kelli) Baker, Kevin (Rita) Baker, Lori (Steven) Goutermont; grandchildren, Paul (Missy) Sneesby, Tiffany (Jay) Oricchio, Tina (Eric) Luftig, Cheryl (Christian) Nelson, Jacqueline Goutermont, Gina Goutermont; great-grandchildren, David and Devon Sneesby, Treyton Larson, Abigail and Camden Luftig. She is preceded in death by her husband, Stuart; and all of her siblings. A funeral service was held Thursday, April 11, 2019 at 11:00 am at the First Congregational Church (110 N 3rd St.) in River Falls. Visitation was held Wednesday, April 10th from 4-7 pm at Bakken-Young Funeral & Cremation Services (805 E Division St.) in River Falls and also on Thursday from 10-11 am at the church. Interment was in Greenwood Cemetery. Arrangements are with Bakken-Young Funeral & Cremation Services. I remember Evelyn from Nybos. What an awesome lady. I am grieved to hear that she has ‘ moved ‘ on Home! God be with you until you meet again! Evie was such a wonderful caring person. I took care of her while I was at Pur House Senior Living. I loved her stories of her growing up and her children. She had a very special place in my heart. My prayers and thoughts go out to her family. My prayers go out to the family. Evelyn was very kind hearted person. She was a blasting to take off. She always had very useful life tips to the young workers. She will be missed. I had a pleasure of taking care such a wonderful women. My prayers go out to the family. Evelyn was very kind hearted person. She was a blessing to take care of. She always had very useful life tips to the young workers. She will be missed. I had a pleasure of taking care such a wonderful women.